Yes, it is the holiday season. My popular windsurfing beach is now dotted heavily with windsurfers and kiters...even a jetski in the mix! Usually, as per the norm, kiters and windsurfers kept a safe distance from each other, bar a couple of show-off kiters who chose to zip in and out among the windsurfers in the windsurfing area. Yes, admittedly, I myself did ended up in the kiters' area "involuntarily" due to the lack of wind, hence couldn't sail upwind. It is not about windsurfers hating kiters. I was helped by a pretty kiter last year when my board separated and blown downwind. I also stopped to check on kiters at times. Yesterday was different. We had at least 50 windsurfers zipping in and out. Most but two kiters kept within their own zone. These two kiters behaved like motor-bikes zipping in and out of a traffic jam. I wonder they are aware of the danger to the windsurfers and also to themselves. Judging by their skills, they were not beginners. Anyway, one of them finally had a close encounter with me. He was doing his stunts right in front of me as I was heading towards a wave. Would I change course for him? No way. So I headed straight for him, full bore. No, we didn't collide, but it was close. I did it intentionally to teach him a lesson. Guess what...He disappeared from sight after that. I wonder they are aware of the danger to the windsurfers and also to themselves. Judging by their skills, they were not beginners. So, your best course of action here was to head straight for one of them, and not alter your course? I wonder if you thought about the danger posed by your actions? I wonder how you would have felt had you actually hit him, knowing you could have changed course and totally avoided even a close encounter? I may be naive, but I am sure there is a better way to approach this situation. ]there have been incidents but usually they stay downwind of us & they are not learners. Well, I knew there will be some who will take a dim view of my action. It was a dangerous move, and was intended so. As I said, it was meant to send him a message to stay away from the windsurfers' zone because he was posing a potential danger to many of us. Please don't worry, I am competent enough to avoid a collision when and if needed. The point is, aus301, it should be everyone's aim on the water to avoid risks. The action of those two kiters were clearly creating un-necessary risky situation for everyone. I took it upon myself to warn him off. Hopefully he will learn his lesson. A better way? As I said earlier, he appeared to be not a novice judging by his skills. He should know the rules, ie. keep to the kiters' zone. it is a common issue as they just won't do the circuit and rather do 50m runs in and out thru the break - it is contrary to all the wave right of way rules. Eventually you may have to just take your right of way and yell at them so they get the message. OTOH a windsurfer did the same to me, tacking in front of me as a I dropped into a bottom turn. Yeah it's the reform on the inside but it is not the place to stop dead in front of those who are riding. So, if you were driving a car as opposed a sailboard, would you take the same course of action? Let's face it. There are plenty of idiots in windsurfing too that jibe, jump or get on a wave without looking first if it's clear. The point is, aus301, it should be everyone's aim on the water to avoid risks. The action of those two kiters were clearly creating un-necessary risky situation for everyone. I took it upon myself to warn him off. Hopefully he will learn his lesson. Look, I wasn't there, I don't know what happened. But from what you have written it would seem you tried to alert the kiters to a risky situation by creating yet another risky situation. So may have made yourself no better than them? You also assumed that due to their skill they would also understand the etiquette of kiting in that area. Now I am no saint, and have had some pretty choice words with other sailors, kiters, surfers etc over the years. But I have never intentionally maintained a possible collision course with anyone. I couldn't live with myself if anything went wrong in that. And regardless of my skill, I can never know how the other guy may react, which may put me in an impossible situation. This type of issue has been around for a long time and it is all about safety. As such, we don't allow surfboard riders to ride amongst swimmers (eg. flagged areas) and it is not legal for jet skis to hotdog and race flat out near other pleasure craft. I feel that kiters need to recognise that the large footprint of water covered by their lines do impose a safety risk to others. They also like to perform extreme jumps etc. Therefore, for safety sake, let's keep them in their own zone before someone is hurt or frustrated emotions lead to unfortunate consequences. Recently, we had two kiters who were mixing it with the windsurfers at a popular location. There was plenty of room upstream where other kiters were doing their thing but these two decided that they wanted to impose theirselves in with the windsurfers. I see this as reckless behaviour when the kiters have a viable alternative. Kites are here tto stay so maybe it is time to bring some sense and order, through dialogue, so that all,groups can operate on the water safely and have fun. Abusive llanguage and fights lead nowhere but to further frustration. In the beginning, the kite invasion in our windsurfing area, it was like dogs and cats, then it quieted down a bit as we got to know each other as well as set some boundaries. We, us windsurfers, had to educate some kiters on wave etiquette, so things got better. But then came the foils, kiters on foils, they crash a lot, and because they go down so fast, their kites often go down as well. Then they get pissed when we sail over their lines, when in most cases we'd have no choice, so then things started to get worse again. Just the thought of crashing into a kiter using a foil was seriously scary, you could loose a limb or even be decapitated by those things. Then something happened that seemed to help, kiters on foils can't ride all the way to the inside on waves because it would get too shallow for their foils, so they would have to stay outside past the waves. So now us windsurfers, at our spot, are hoping that all the kiters get foils, then us windsurfers will get all the waves. At present most kites (and Windsurfers) are anonymous to any relevant authorities be that rescue or policing. Maybe it's time to discuss registering all kites and sails with numbers issued by the appropriate governing body (Wind/Kite surfing association) for a small fee at time of purchase. These fees go towards education, signage and other associated costs of trying to keep the public safe. The last thing we want is to be banned from beaches and areas because someone simply didn't know the rules or was just being dangerous. Putting the onus on the individual and not on the whole sport might seem to wake some people up. AWESOME idea!!!!!!!!!!!!!! another charge because some peanut can't give you a bit of space out in the break, like the sea isnt big enough. Why put 100% people to task when 1% of the F-wits act like tools! Hey man maybe because it's that 1% who'll screw it up for everyone. When your local spot gets windsurfing and kitesurfing banned and you've got to drive an extra 20-30k's to go for a sail after work just remember this post. And it won't be a Windsurfer v Kiter incident that ruins it, it'll be a member of the public who gets injured. then its all fncked for everyone. And without the ability to single out the person as per car or boat registration, "they" will put a blanket ban or restrictions on everyone cos its easier. Im not saying that this is the answer but people need to be made accountable for the actions. And the governing bodies need to have conversations with their members, councils and SLSC's on ways of protecting the areas that we all sail in. Would you prefer to have a 50 M length of ropes tangled around you? Or worse still, have them sliced through your neck? For me, it is simple. I would rather him taking the blunt of my windsurfer and myself, rather than the other way round. Yes, not a nice way to enjoy a day's outing. Regardless of whether you are for or against my action, I thought the safest way to do our sports is separation. 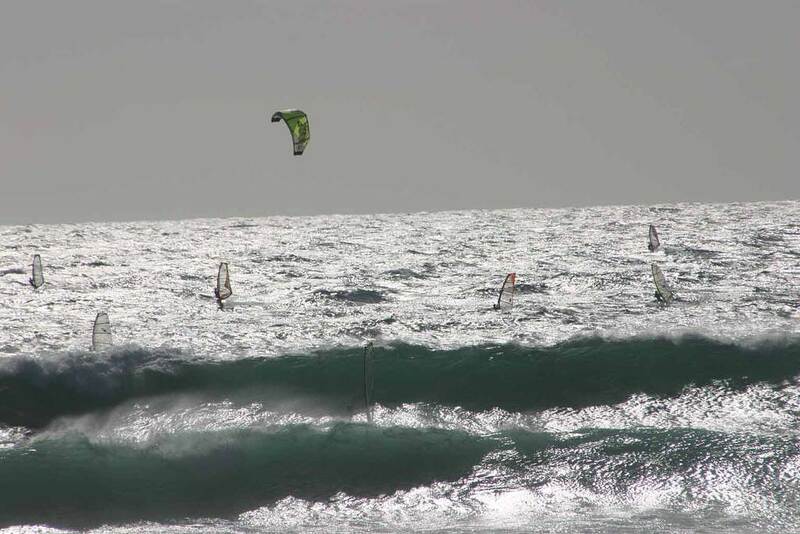 In the simplest form, the windsurfers keep within their own zone and the kiters theirs. Yes, as I said at the beginning, windsurfers can drift into the kiters zone as I had done on quite a few occasions. It was so because the wind died off and I couldn't go upwind. If that happened, I always endeavour to give the kiters the right of way. I case you think I hated kiters, I don't. I received a huge favour from a lady kiter who retrieved my board which was separated from me. I have spoken with the local kite/windsurfer shop owner who is also a kiter. He reckoned some of those idiots who took delight in showing off their talents probably are overseas fly-by-nighters. They don't do it now though. I did read the messages though. It appeared there were a bit of bragging about some stunts of sort?